I can remember distinctly my first experience with the world of Jurassic Park. It’s etched into my memory because it was the junior high 8th grade book fair and the school library was crowded with brightly decorated tables packed with the newest in popular fiction and non-fiction. It was then I came across Michel Crichton’s newest. I had read The Andromeda Strain and Congo and Sphere, and my first thought when I examined the cover, inscribed with the shadow of a tyrannosaurus skeleton set against a stark white background was that this was never going to take off. In the 25 years since the original novel’s release, the sales of all manner of Jurassic Park merchandise has undoubtedly proven my 12 year old self mistaken. One can cite a number of differing theories on why the allure of the world created in Jurassic Park is so provocative. Perhaps humans are historians at heart, curious about an era that we would never have any place in. Perhaps the novel awakened the long dormant scientist in many of us, by effectively melding the biological, with the technological. Perhaps it is as simple as having a sense of wonder, a sense of curiosity about these magnificent creatures, that we as humans were destined to never share the same world with. 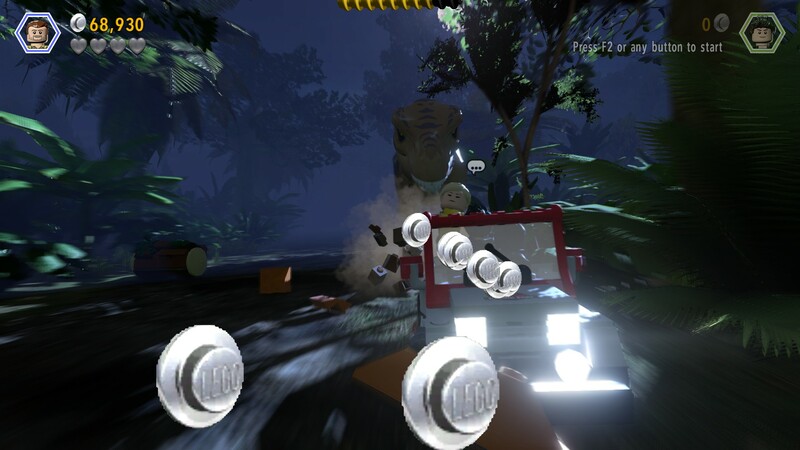 Traveler’s Tales, who have created a virtual Lego industry with their previous titles, have seemingly created their most ambitious Lego game thus far with Lego Jurassic World. It may not have the sheer density or scope of some of their previous works, but what it does contain includes some of their most interesting mechanics, in terms of gameplay, and a lush open world design that’s almost begging to be explored. Oh, and dinos. Lots and lots of dinos. The game whisks you from the opening title screen, which features a rousing rendition of John Williams’ iconic score, right into the beginning of the original Jurassic Park, set on the fictitious island of Isla Nublar. Your extended stay within the world of Lego Jurassic Park will take you from the first movie, through The Lost World, Jurassic Park 3, and the main attraction, Jurassic World. Along the way, you’ll cover most of Isla Nublar and Isla Sorna, sometimes on foot, at times by Jeep, and even occasionally by ATV or bike. The way the game works is that once you finish story mode in the first movie, you’ll unlock the ability to dive right into the second, and so on. Each movie has to be completed in progressive order, at least at first. In between levels, you’re free to roam the islands, freely healing sick dinosaurs, colleting copious amounts of Lego currency, assisting workers in peril, and searching for prized red and gold bricks. Lego Jurassic World features more of the pseudo puzzle solving meets platforming that has become a showcase of the Lego gaming franchise. Character specific abilities, while present in previous titles, have been taken to a whole new level here. For example, you’ll need to utilize a variety of characters to survive the game’s many puzzles, from simple door switches and target shooting, to computer analysis and equation themed riddles. Since every character has their own special abilities, often corresponding with the tasks they perform in their respective films, every character feels like a unique asset to your ever-expanding arsenal of intrepid explorers. For instance, Dr. Grant can dig up dirt piles to uncover secrets hidden within and, being a paleontologist, can assemble useful objects out of hidden dinosaur bones. Ian Malcolm, a mathematician in the original film, can solve equation based puzzles and is equipped with a flare that he can use to light up dark caves. Similarly, characters like Lex can use her computer skills to access certain computer terminals, while Eric Kirby from the third film can use his bottle of T Rex pee to clear herds of smaller dinos. (Plus it goes for a ton on the T Rex pee market). In your character library, each character’s abilities are listed at the top of the screen, and while this is very nice, especially given the number of characters available, trying to recall who does what can still be a bit of an ordeal. From time to time, Jurassic Park notary Mr. DNA pops up, his colorful helix aglow with neon pink, blue and yellow, to offer helpful tips and hints in certain places. This is a nice idea on paper, but in actual practice in-game, he seems to pop up arbitrarily, usually in an effort to state the obvious, but some puzzles and mechanics involving certain characters are so vague, and in these instance Mr. DNA is nowhere to be found. This creates something of an odd disconnect, wherein you’re frequently aided by helpful tips and hints, but often only when you need them the least. In terms of graphics, this is probably the nicest looking Lego game you’ll come across, which should come as no surprise, considering this is the most recent entry in the franchise. Highlights include some very well done weather effects, and the Lego dinosaurs look exceptionally nice, especially the velociraptors, who seem to convey the right balance between menacing predator and Lego-style whimsical flair. In terms of aural quality, everything sounds rather nice as well. From Williams’ iconic score, (which may get on your nerves after awhile, but can be turned off) to darker, more dramatic moments, where the volume and intensity ramps up considerably, the mood is always suitably maintained. The voices and lines are all ripped straight from the films, so you’ll hear all the important one-liners at key moments from the JP franchise. Everything from Dennis Nedry’s lamenting about how he’s totally underappreciated in his time, to Ian Malcolm’s, “Mommy’s very angry!” is in here and, for the most part, key scenes and locations look, sound, and most importantly feel, like they did in the films. In keeping with the trend of wholesome family entertainment that the Lego series is known for, no one in the game actually dies, even if they did so in the films. For example, Dennis Nedry’s fateful encounter with a Dilophosaurus in the first film ends in tragedy there, but in the game, he simply jumps in surprise and runs off, in true comedic Lego fashion. Speaking of comedy, the infamous Lego humor is back, and fills many a scene with its unique mix of whimsy and charm. Whether its quickly building a Lego bunny to distract incoming enemies or seeing Robert Muldoon try and distract a velociraptors with a hot dog, you’ll probably find yourself smiling at least once per film. In an effort to educate, as well as entertain, during the brightly colored loading screens, Mr. DNA appears on screen and offers a tidbit of information about the world that these creatures once inhabited. It’s a great idea, especially given that Lego games are typically targeted at a younger audience. However, since each fact is simply listed on screen, instead of actually narrated, most younger players will need assistance with reading and understanding them. It’s not a perfect game, though. There are a few flies in the ointment (or rather mosquitoes in the amber, in Jurassic World terms). The controls can be a bit finicky, making the platforming a bit more challenging than it should be at times. Also the camera doesn’t always select the best angle to showcase your in-game accolades, so sometimes you’ll be treated to an extreme close up view of the ground or the sky, or an in-depth look at a static piece of foliage. Also some switches require precise positioning in order to interact with them; simply approaching them from the front doesn’t always cut it. Glitches like characters getting stuck in places can occur as well, though thankfully they aren’t terribly common. Humanity and dinosaurs are two species that were destined to be separated by 65 million years. Yet our fascination with them continues, in fiction, in film, and in the entertainment industry. As children, we were fascinated with these larger than life creatures, in shows like The Flintstones and Land of the Lost. Perhaps we grew up as paleontologists or archaeologists, seeking to unearth the mysteries of the past by finding clues buried in the present. Even though we are products of a shared world, our world today is much different than the one inhabited by these larger than life creatures. One could argue that Michael Crichton created a world, one that, in some ways, is vastly more relatable and accessible than the one found in our history books. 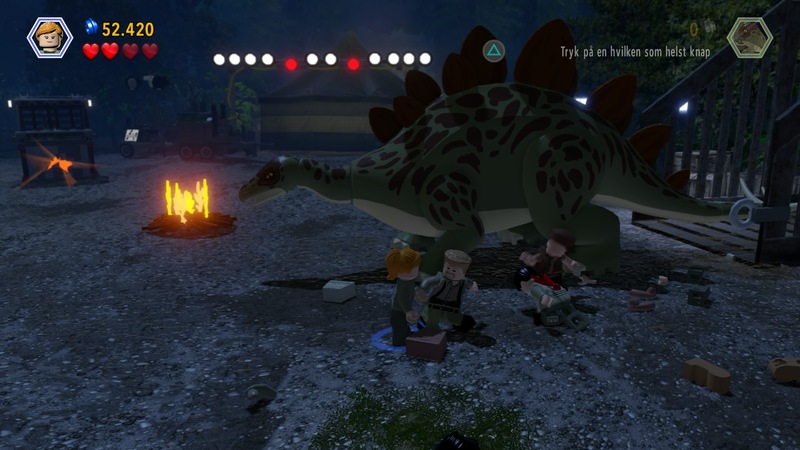 In regards to Lego Jurassic World, Traveler’s Tales have also created a world, rich in history, soaked in collectibles, and brimming with whimsy and family friendly fun. It isn’t a perfect world, by any means, but honestly, what world is?